Over 1,000,000 Motorcycle Tourists Visited Montana in 2013! Billings – Montana’s Trailhead – A Rider Friendly Western City Located 1 hour from the Beartooth Highway and a couple hour ride to Yellowstone Park. 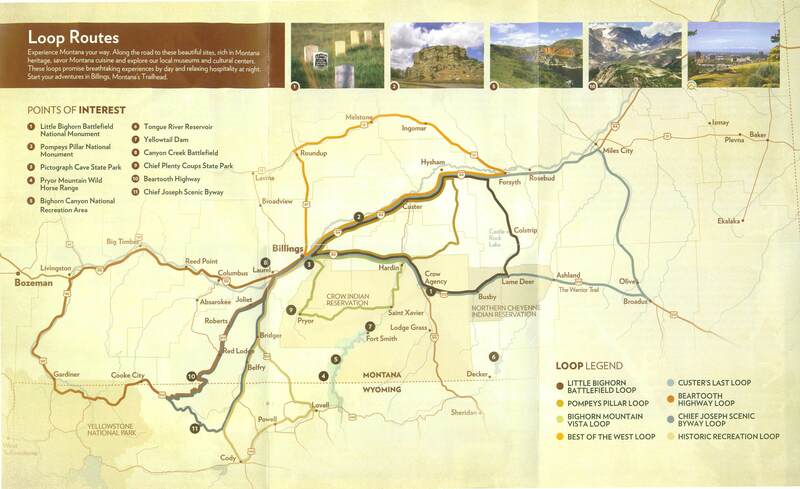 Get your Billings Area Ride Map here (jpg)…. Very few of life’s activities can measure up to motorcycle riding. If you are an enthusiast, you know what we are talking about. If you have never ridden a motorcycle, or toured the United States on a bike, you should consider trying it out. Be it riding off-road, riding on the highways and back roads or racing, the thrill, freedom and ecstasy of riding a motorcycle is truly one of the best things one can experience. To ride some of the thousands of miles of roads in Montana, Big Sky Country, where there are fewer residents in the state than in the city of San Jose, California, the enjoyment is even greater when you’re not so concerned about negotiating a 6 lane freeway amongst thousands of trucks and cars. Riding and touring on a motorcycle in Big Sky Country is one of the “must do” activities for any motorcycle enthusiast. On a trip with other bikers a few years ago, marveling at the huge, blue sky, we were struck with the idea that has become one of our trademarks, Ride The Big Sky®. Billings is referred to as Montana’s Trailhead. Watch a video about Billings, Montana and what makes the city special. Billings is just an hour from the Beartooth Highway and Yellowstone Park, an hour from Red Lodge which hosts the annual Beartooth Rally, and about 4 hours northwest of Sturgis, South Dakota. If you are planning a motorcycle vacation, we encourage you to take in the sites and scenes in the Billings area as you Ride The Big Sky®. Check out the videos on our MySpace site to see more about what it means for us to Ride The Big Sky®. Recreational Action Sports Entertainment, LLC (“RASE”…pronounced like “race”) is an ardent supporter of the American Motorcyclist Association (“AMA”). We have personally belonged to AMA since 1974, and RASE is an approved AMA sanctioned promoter. We encourage anyone that rides motorcycles or ATVs to consider membership in AMA and support their tireless efforts to protect and further the rights of motorcyclists. The Billings Chamber of Commerce and TBID has provided a great deal of support to Recreational Action Sports Entertainment and Billings Motorcycle Club. Without support of the Chamber, TBID, MetraPark, Yellowstone County and many of the fine, tourist friendly businesses in the Billings area, building The Warm Up® would not have been possible. BMC and RASE were honored by the Billings Chamber of Commerce, each receiving the Roche Jaune award for Tourism Excellence for promotion of motorcycle tourism for the Billings area. – Learn more about the Billings area on the Chamber’s web site: VisitBillings! The Beartooth All American Highway has been described as the “single best motorcycle road ride in the United States”, and was voted the #1 motorcycle road ride in the United States in 2011 by American Motorcyclist Association members. Located about 1 hour from Billings, the ride takes you from the prairie to the top of the 12,000′ Beartooth Mountains, through some of the most beautiful road riding scenery in the world. For a motorcycle oriented article, click here to Read more. The Beartooth Highway even has its own web site at beartoothhighway.com. We have posted a virtual ride up the Beartooth Highway switchbacks on our Facebook page at http://www.facebook.com/ridethebigsky. Sixty miles from Billings, Montana’s Trailhead, the Red Lodge, Montana area opens its doors and welcome tens of thousands of rider for the annual Beartooth Rally in July each year. Red Lodge is at the base of the Beartooth “All American” Highway, one of the single best day rides around. Each year the rally features a variety of live music , charity events, a kickin’ street dance, merchandise, great food and drinks and the highlight of the event, the famous Iron Horse Rodeo. Click here to go to the official Beartooth Rally web site.